Accentuate the look of your home with this Polyresin Musical Buddha Set from Creativegifts.Musical Buddha Set has an artistic and highly detailed design that makes it a wonderful decorative accent. This statue set will create a stunning focal point for a end table, empty shelf and a console table placed at your entrance or hallway. 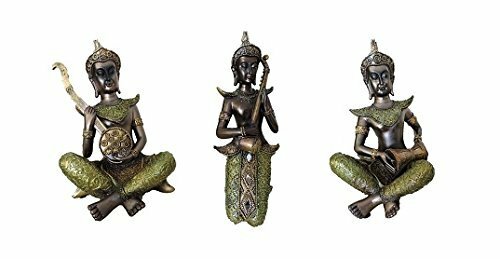 This Buddha showpiece set is unique and features the Buddha playing 3 different musical instruments. If you have any questions about this product by Creativegifts, contact us by completing and submitting the form below. If you are looking for a specif part number, please include it with your message. Home Decor Thai Couple of Peacock with Glass Hand Carved Wood Wall Art, Thailand Work Art By WADSUWAN SHOP. Home Decor Thai Couple of Peacock Pianted Hand Carved Wood Wall Art, Thailand Work Art By WADSUWAN SHOP. Super Large Spirit House, Traditional Thai ,Made From Teak Wood the Temple Has Two Roofs, Inc.. by Thai Craft , Size: 20x20x32 inches.